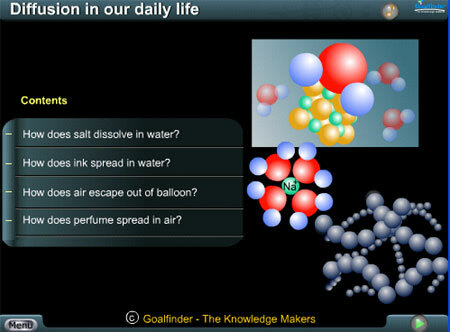 Diffusion occurs in many ways in our daily life, spreading of perfume, deflating of balloon, mixing of salt or sugar in water, spreading of ink in water. Each of these phenomenons is explained through animation. How does salt dissolve in water? How does ink spread in water? How does air escape out of balloon? How does perfume spread in air? There are various processes in life where diffusion is evident; diffusion is the primary procedure for daily occurrences like dissolving of salt in water or exchange of gases in our lungs. Some processes using diffusion are outlined above. Diffusion is the underlying procedure for many processes that are there in our daily life for example gas exchanges at alveoli - oxygen from air to blood and carbon dioxide from blood to air. In the animation, we have covered four instances of diffusion, these are everyday occurrences that we can readily identify with, however the application of diffusion is vast. The animation explains the usage in a clear and lucid manner; students will find the explanation very easy to follow.